Preheat the oven to 160C. Line 2 round cake tins with greaseproof cake liners. In a large bowl, beat together the butter, sugar until pale and fluffy. Add the eggs one at a time and beat until fully combined. Add the vanilla extract. Sift in the flour, baking powder and bicarbonate of soda and beat until smooth. Spoon the mixture into the tins and bake for 1 hour, or until a skewer comes out clean. Leave for 10 minutes to cool, then remove from tins and cool completely. In a bowl, whisk the double cream until peaks form. Put aside in the fridge. In a large bowl, beat the butter and soft cheese until smooth. Stir in the icing sugar and melted chocolate. Stir in the strawberry jam and whisked cream. Place in the fridge for a couple of hours to thicken. Using a serrated knife, cut the cakes through the middle to make four layers. Set one layer as the base on a plate or cake stand. 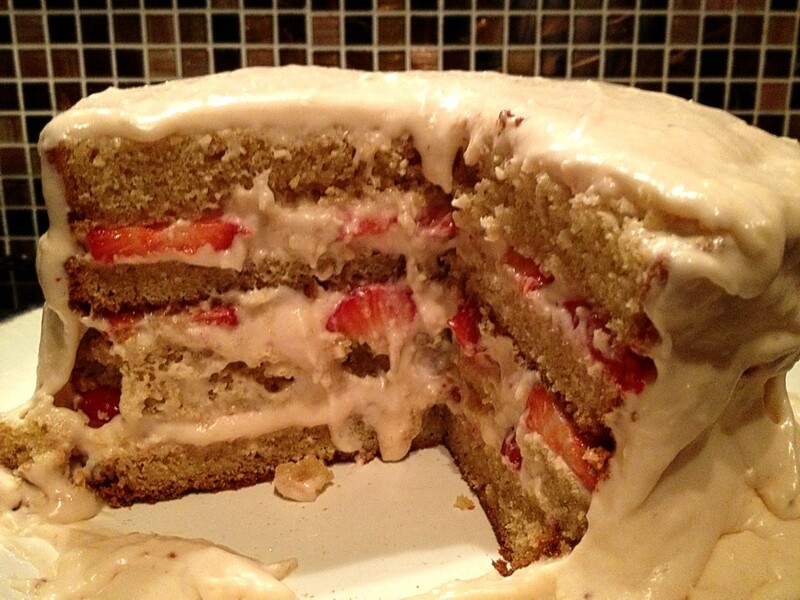 Spread a layer of cream cheese on it and then some sliced strawberries. Place the next layer over the top and repeat until the top layer. Spread the rest of the cream cheese over the top and sides and chill in the fridge. This is a mega sized cake and delicious. It is ideal for summer parties as it feeds many people.